The red shaded areas will have their water supply disrupted for the day. 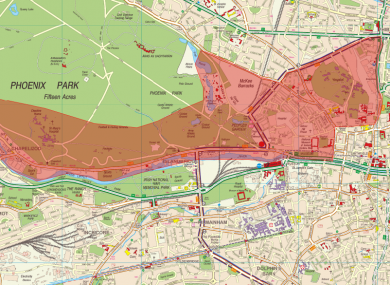 A BIG SECTION of Dublin’s northside will have its water supply disrupted for the day – with a potential loss of water in some areas. This supply will be affected from 8am until midnight tonight. While the works are being carried out, the water supply in certain areas will experience reduced pressure and may be cut off for a time. The supply in nearby surrounding areas will also be affected. Dublin City Council has said that it will provide water tankers in affected areas should the supply be cut off. The water tankers will provide drinking water as well as water for cooking should the supply be lost. A spokesperson for Irish Water said that a leak had been detected on a large water main in the country and that it needed to be fixed as a matter of priority. “If the repair was not carried out as soon as possible, it could result in a lot of disruption to the water supplied to our customers,” the spokesperson said. For that reason, the work has been scheduled to take tomorrow to help minimise any disruptions to the water supply for our customers and any further damage to the water main. Anyone experiencing any problems can call Dublin City Council on 01 8643634 during the day or 01 6796186 after 5pm. Email “Living in north Dublin? These areas will have the water supply disrupted for the day”. Feedback on “Living in north Dublin? These areas will have the water supply disrupted for the day”.